No team has been able to rally from a 0-3 start and make the playoffs (like the Houston Texans) in 20 years; only five have since 1980. Only three teams in NFL history have been able to rally from a 1-5 start (like the Indianapolis Colts) and make it. So, just by making the postseason, both teams have accomplished what was thought to be close to impossible. But the question now is who is going to do what really matters– win Saturday’s Wildcard game and move on to the next round? The Colts may be the one team no one really wants to face right now. After starting 1-5, they somehow pulled off an impressive in-season turn around going 9-1 the rest of the way to earn a playoff spot. Andrew Luck appears to be playing better than ever. He has gone from getting next to no protection to becoming one of the least sacked quarterbacks in the league (18 during the regular season). He isn’t doing it alone, of course. Marlon Mack has given the team a legitimate running game for the first time in years. But more importantly—the defense has been incredible during their 9-1 stretch. They beat the Texans in Houston in Week 14 in a game that was not nearly as close as the final score made it appear to be (24-21). The following week they dominated the Dallas Cowboys. However, while they won their final two games, over the Giants and Titans, they didn’t play nearly as well against either. For the Texans, the formula is going to be much like it was throughout the regular season—do what they are god at, running the ball and playing defense. But the run game will have to come from more than just Lamar Miller. The Texans will need to get Deshaun Watson involved as well. But they will somehow need to keep him from getting hit as much as they can. The less time Andrew Luck spends on the field the better. But when he is on the field, the Texans have to make it hard on him. 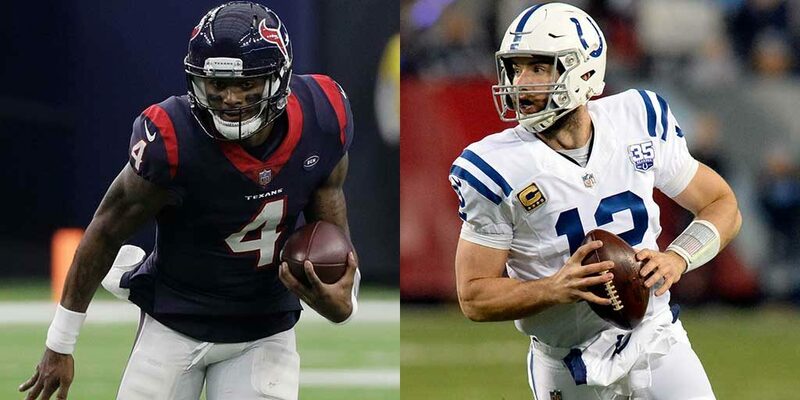 The Texans recorded a third of the sacks the Colts have given up and will need to dial up the pressure if they are going to win. If they don’t, there is a good chance Luck has another career day against Houston’s poor pass defense (he gashed them for 464 and 399 yards during their two regular season games). Once again, Indianapolis is not going to be able to run the ball for much against the Texans. But since they can pass the ball so easily, you almost have to wonder why they would bother even trying. Houston had the 28th ranked pass defense during the regular season and there is no reason to think they are going to play any better this week. Deshaun Watson will have a good enough game to keep the Texans in the game. But unless they discover a way to slow down Andrew Luck, they don’t stand a chance. Look for the Colts to win, straight up and against the spread (+1.5). As for the over/under (48.5), with the importance defense is going to play in this one—take the under.